This new formulation of ROOTSHIELD contains two active ingredients-the patented Trichoderma harzianum strain T-22, and Trichoderma virens G-41. These two strains are 100% compatible with Mycorrhizae. ROOTSHIELD PLUS+ provides 3-months of preventative control of major root diseases such as Pythium, Fusarium, Phytophthora, Rhizoctonia, Thielaviopsis, and Cylindrocladium, with improved suppression of the aggressive hot season Pythium. When ROOTSHIELD PLUS+ is mixed with water at 6-ounces per 100-gallons of water over 150-billion spores are applied in one application. The spores germinate in 16 to 24 hours. As the Mycelium emerges from the spore it immediately starts coiling around the plants roots and any plant pathogen propagules present. 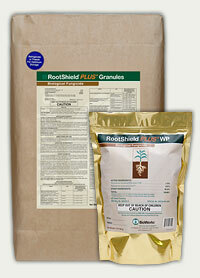 After 24-hours ROOTSHIELD PLUS+ cannot be leached from the soil. 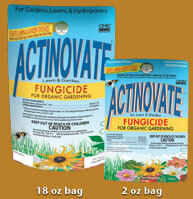 Actinovate Lawn & Garden is an organic fungicide containing the patented microorganism Streptomyces lydicus WYCES 108. When applied this powerful microbe grows on the surface of the plant's roots and foliage, feeding off plant exudes while at the same time producing by-products beneficial to the plant. Companion Biological Fungicide is a practical, environmentally sound product that is used for broad spectrum disease prevention. 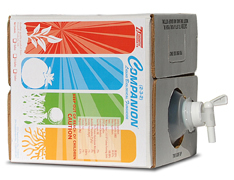 As the 1st EPA - registered biofungicide in the U.S. market, Companion is revolutionizing growers ideas about disease control and sustainability. Companion is 100% organic and natural. Please call us for a special price on 30 gallon or 55 gallon barrels. Companion Biological Fungicide is now available in a wettable powder. This new product is a great way to help control diseases on giant pumpkin plants and most other fruits and vegetables. The Companion Wettable Powder is over 275-times more concentrated than the liquid Companion. The active ingredient which is “Bacillus Subtilis GB03” is 11.5% in the Wettable Powder and .03% in the standard Liquid Companion. The wettable powder is much more cost effective. Even at an application rate of ¼-teaspoon per gallon of water you will have a much more robust application than with the standard dilution rate using the liquid. Companion Wettable Powder may be used as a seed treatment, used in drip irrigation, applied either in a furrow or banded, and also as a foliar spray or drench. Cucumber beetles and other pests effecting giant pumpkin plants are attracted to the color yellow. You will often find them inside the yellow blossoms of giant pumpkin plants and other vine crops. Squash Vine Borers are a serious pest for growers of giant pumpkins and other vine crops East of the Rocky Mnts. SVB traps are a proven way to intercept the Squash Vine Borer in the moth stage. Biorepel - “It makes bugs think your pumpkin patch is a field of garlic” BIOREPEL is a cutting-edge, all natural insect repellant that works on the opposite tactical consideration of pheromones. We now are a direct distributor for Gro-Quick Soil Warming Cables. We can offer this quality item delivered to your door for a much lower price than you can buy them at the store! The suggested retail price for the 48-foot Soil Warming Cable (without shipping) $ 55.42 and $ 43.58 for the 24-foot cable. These soil warming cables have been a big part of our success and we want to make them available to other growers at the lowest prices we can. This tool makes it easy to measure small amounts of concentrated liquids. The device allows you to draw ½-teaspoon to 2-teaspoons of concentrated chemical directly out of the container, and then discharge that amount into a sprayer or other container with a measured amount of water. These 2 mil plastic seed packets have a ziplock and measure 3" x 4" They work great for seeds or other small items and are reuseable. Small printed labels can be printed out to identify the seeds or other contents. This is a 4-inch clamp that snaps onto PVC Pipe, and can be used to attach plastic to a PVC frame for a greenhouse or cloche, or to attach to a tarp or shade cloth for sun protection over a giant pumpkin. Available in ½-inch and ¾-inch to fit PVC pipe. WINTER RYE is the hardiest of the winter grains. WINTER RYE will germinate at temperatures down to 35-degrees F. and produces more organic material than most other cover crops. "A SOIL SALT REMOVER". Many soils can accumulate excess salts from repeated applications of fertilizers and manure. SALT DOWN is a calcium source which reduces excess sodium levels in the soil. WEED ZAP is an all-natural non selective herbicide for grasses and weeds. WEED ZAP is made with clove oil and cinnamon oil. It controls both annual and perennial broadleaf and grassy weeds. WEED ZAP is a contact herbicide and will not translocate to other plants. USE: 6.4-ounces WEED ZAP per gallon of water.